9489 Endor Rebel Trooper & Imperial Trooper Battle Pack is a Star Wars set released in 2012. Along with the 9488 Elite Clone Trooper & Commando Droid Battle Pack, it is the first battle pack to be released to contain with two minifigures of opposing factions, rather than four of one faction. This set includes four minifigures: two Rebel Commandos, a stormtrooper and a Scout Trooper. This set features a speeder bike and tree. The tree is of a simple build, curving over a small Rebel defense post. The emplacement consists of a turret and flick-fire missile launcher. A weapons rack with two blasters is also there. The speeder is mainly brown and grey, with two black rods protruding from the front representing the barrels of blasters. The tips of the rods are covered by brown triangular plates. Behind the controls of the speeder is a place to store a supplies pack. The speeder is nearly identical to that of the 2011 Ewok Attack except for a few changes to the back area. On Endor, Scout Troopers used speeder bikes for quick traveling when guarding the shield generator of the Death Star II. When members the Rebel Alliance snuck onto Endor to destroy the generator, battle broke out. Stormtroopers fought on the ground while Scout Troopers attacked from their bikes. The Rebels had the help of an indigenous force, however, and were able to secure a victory. One of the Rebel commandos has the same face printing as Indiana Jones from the 7196 Chauchilla Cemetery Battle set. One of the Rebel commandos has a new torso, along with the face of the cook minifigure from the Pirates of the Caribbean theme. The Stormtrooper has a new torso piece. The speeder is different than the one featured in 7956 Ewok Attack. The Stormtrooper and Scout Trooper have new printed faces. There is a comic of this set on the LEGO Star Wars homepage. In the instruction booklet version, the Rebel Commandos have two cook heads and two standard variant Rebel Commando torsos. The Stormtrooper was not included for an unknown reason. In the online comic version, the Rebel Commando's torso is incorrect, and two Speeder Bikes are included instead of one. On preliminary set images, the two Rebels feature grey gloves rather than sand yellow gloves. This is a description taken from LEGO.com. Please do not modify it. 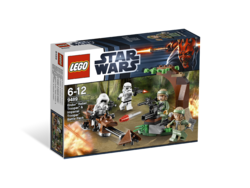 (visit this item's product page) Surprise the Imperial troops at the Battle of Endor! Fire the flick missile from the Rebel hideout! Facts about "9489 Endor Rebel Trooper & Imperial Trooper Battle Pack"
This page was last edited on 9 January 2016, at 21:11.